Would a lower oxygen level affect dinosaurs? Yes, with a lower oxygen level, the dinosaurs could have experienced extreme respiratory stress. This is similar to what humans encounter when living or working at extremely high altitudes without supplemental oxygen. Today’s atmospheric oxygen level is 21 percent, but modern animals have the proper physiology to live in this atmosphere. Dinosaurs first evolved when the atmosphere was oxygen rich, and they had the right physiology for this situation. Studies of an Apatosaurus skeleton show a limited capacity to breath, with relatively small nostrils and probably no diaphragm. This was fine as long as the atmosphere was rich in oxygen, but it was inadequate when the oxygen levels fell. Under this scenario, dinosaurs may have experienced three different events leading their gradual extinction. First was a cooling climate toward the end of the Cretaceous period. Second, the oxygen levels might have fallen, making it extremely difficult to breath. This probably led to a reduction in dinosaur diversity, shrinking the number of genera from 35 about 10 million years before the end of the Cretaceous period to only 12 at the end. At that point, a third and final catastrophic event may have occurred: An asteroid impact or impacts, and/or volcanic activity, which finally pushed the remaining dinosaurs to extinction. 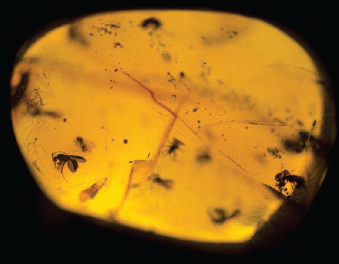 Amber, which is fossilized tree sap, has been found to sometimes preserve fossil evidence, such as ancient insects, and even bubbles of oxygen, which may be analyzed for clues about the prehistoric atmosphere (iStock).